Los Angeles – Nov. 20, 2008 – Film, television and video game composer Garry Schyman has created the original music score for the newest installment of the acclaimed Destroy All Humans! video game series. 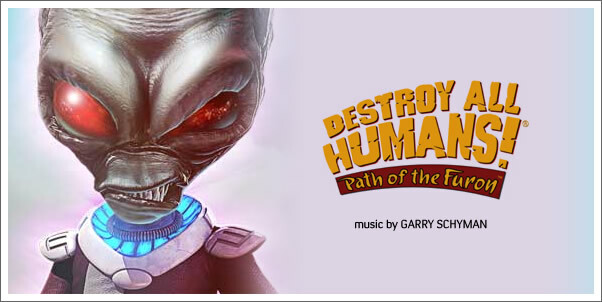 Developed by Sandblast Games (THQ Inc.), Destroy All Humans!® Path of the Furon™ is set in the 1970's and the game’s score is inspired by music styles from that era. Schyman’s musical influences for DAH Path of the Furon include classic 70’s film scores by Lalo Schifrin, Jerry Goldsmith and Roy Budd. The DAH Path of the Furon score was recorded with a live symphony orchestra as well as brass band, flute soloist, saxophone soloist and wah wah guitar performed by A-list musicians in Hollywood. Garry Schyman's music for video games has received the Interactive Achievement Award from the Academy of Interactive Arts and Sciences for “Outstanding Achievement in Original Music Composition,” Spike TV Award for “Best Original Score,” G4TV Award for “Soundtrack of the Year” and four Game Audio Network Guild Awards, including the prestigious “Music of the Year” Award. Garry Schyman is represented by the Gorfaine/Schwartz Agency. For more information on the composer visit www.garryschyman.com. Destroy All Humans! Path of the Furon is scheduled to release for Xbox 360® in December 2008. For more information please visit www.destroyallhumansgame.com. THQ Inc. is a leading worldwide developer and publisher of interactive entertainment software. The company develops its products for all popular game systems, personal computers and wireless devices. Headquartered in Los Angeles County, California, THQ sells product through its global network of offices located throughout North America, Europe and Asia Pacific. More information about THQ and its products may be found at www.thq.com and www.thqwireless.com. THQ, THQ Wireless, Destroy All Humans! Path of the Furon and their respective logos are trademarks and/or registered trademarks of THQ Inc. For more information please visit www.thq.com.